We can feel it, hear it and we can even see it from space! Europe is hit severely by a heat wave. Everybody is sharing images and comparisons of landscapes before and during the drought connected to this heat wave. But what is actually going on? How extreme is it? And most importantly, what is the impact on our agricultural sector? Since early spring Belgium and large parts of north-western Europe are facing one of the most intense regional droughts of the past decades. It is part of a larger heat wave affecting the northern hemisphere, caused by a weaker jet stream which is further north than usual. As a consequence, hot high-pressure air above North America, Europe and Asia are trapped and are blocking low-pressure systems that would bring cooler air and rainfall. This period of severe drought recalls the summer of 1976 and indeed on the graph above we see that on average the anomaly of precipitation today is similar to the situation of 1976. In 1976 the drought started earlier, but the lack of rain brought us to the same situation. But there are regional differences in our country. Less stable air masses over southern Europe have caused rainfall in Wallonia, especially in May and June, while Flanders has remained dry. 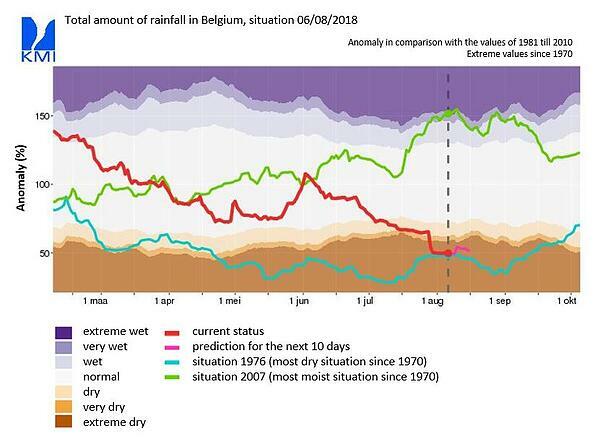 Ukkel, located in the centre of Belgium, has received 13.9 mm of rain in May and 15.8 mm in June, as compared to climatological normals of 66.5 and 71.8 mm. No wonder our soils and crops are in desperate need for water. Various satellite images made by PROBA-V, Sentinel-2, Sentinel-3, MODIS, … clearly show the effects of drought and heat on our landscapes, but the true value of satellite images appears when this data is translated into meaningful information. Maps and products to see the exact impact and determine how to respond to this extreme situation. 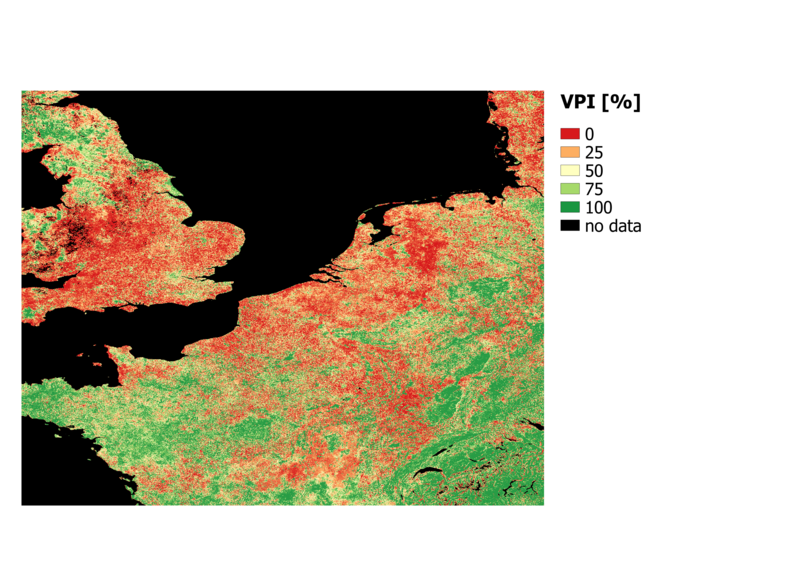 The Copernicus Global Land Service of the European Commission provides the Vegetation Productivity Index (VPI), an overall vegetation condition every ten days by comparing the current value of the NDVI to the long-term statistics for the same period. The VPI is a percentile ranking of the current NDVI value against its historical range of variability. This information allows us to show that the current observations correspond to the lowest 25% of all observations ever made by satellite data. How does this affect our farmers? It’s clear that this situation will affect the agriculture yields in Belgium and surrounding areas. The growing season had a rough start with the lingering effects of winter continuing into April which essentially delayed its start. The severe drought and heat episode are causing a very adverse situation. Farmers are working very hard to keep the impact as small as possible, but still fear to end up with smaller harvests both in quantity and quality. Nele Cattoor from VEGEBE (Union of the Belgian vegetables processing sector and the trade in vegetables for processing) is following the situation closely. “It is still too early to put exact numbers on the impact, but this will most certainly affect the sector at least until Christmas. Just think about vegetables such as beans, spinach or cauliflower which need to be harvested in late summer or autumn but cannot be sowed in these conditions." The drought will have an irreversible negative impact on the crops that were hit by the drought during the flowering and yield formation. Looking at the arable land, we see a clear difference in the winter and summer crops. Joost Wellens, agronomical expert at the Univeristé de Liège, gives us some insights on the status of the crops and what can be expected. “Winter crops experienced flowering and yield formation largely before the heat wave and drought period, leading to a harvest which is even slightly better than last year, as recently confirmed by farmers. Winter crops could also be harvested 1-2 weeks earlier than average. More information about the status of the crops and the expected yields can be found in the agrometeorological bulletin which has been disseminated monthly during the agricultural season since 2002. The bulletin is published and distributed in French and Dutch. Specifically for the agricultural sector VITO developed WatchITgrow. It allows everyone in the potato value chain to monitor every single potato field in Belgium. 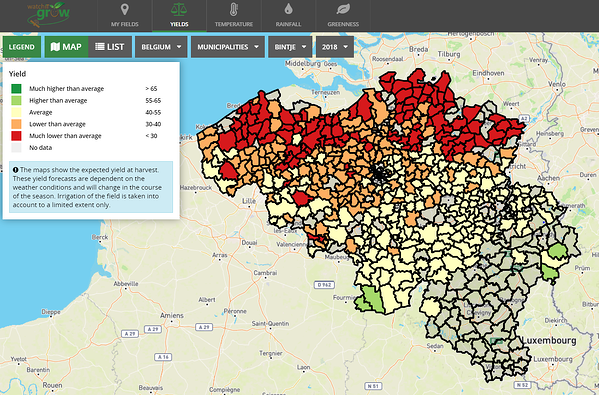 Information maps clearly show that the North of Flanders is most affected by the drought, both in quantity and in quality. The potatoes are much smaller and hence not suited for the production of our famous (French)Belgian fries. According to local farmers we have passed the point of no return: Even if it starts raining today, the damage to the plants on non-irrigated parcels is irreversible. The fear remains that this kind of long dry spells will occur more frequently in western Europe in the future, as predicted by many climate models. We are evolving towards long dry spells alternated with short but heavy rainfall in summer time. Climate Smart Agriculture (CSA) could be the solution to cope with this more frequent occurrence of extremes; CSA are agricultural practices that increase productivity sustainably and increase the agricultural system resilience to climate change while reducing greenhouse gas emissions. It is based upon integrated management of water, land and ecosystems at landscape scale. In short we will have to adapt our traditional approaches to come up with better, smarter, more resilient and sustainable agriculture. Get the latest staff articles and eye-watering pictures as they come out. Subscribe to our newsletter.